The other day we had a question from one of our Facebook page fans asking what the problem is with paper bags. We all know there is a movement around banning single-use plastic bags, and the reasons why single-use plastic bags should be banned are pretty clear. They are made from nonrenewable resources, they do not safely breakdown, and they are a serious threat to the planet. 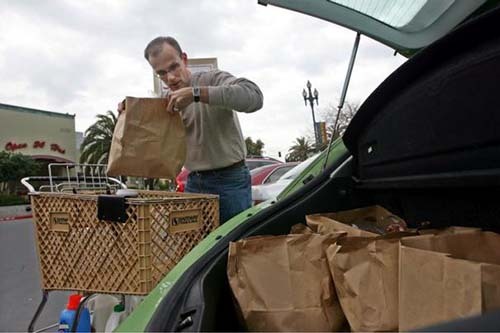 A lot of the legislation around plastic bags includes disposable paper bags, and this leads many people to ask, “What’s the problem with paper bags?”. The issues that make single-use plastic bags a clear problem aren’t always applicable to paper bags. After all, paper bags are made from renewable resources and often they are made from a percentage of recycled content. Paper is biodegradable, and is not a health hazard to animals, ecosystems and the planet at large in the same way as plastic bags. So really, what’s the problem? Let us break things down for you. Many shoppers save their single-use paper bags, and they may end up being used a second or third time, but these bags are not intended or designed for long-term use and also do not offer long term marketing. Millions of trees are cut down each year to create the billions of paper bags that are used each year by consumers; sometimes just for minutes. Single-use bags are used on average for 20 minutes, so even if they are used a few times when you tally up the amount of resources that go into creating these bags, it just doesn’t measure up to the amount of time these bags are used. Trees serve a lot of useful purposes, like being harvested to create construction materials, or converting greenhouse gases into breathable oxygen. These are very important uses of trees, and cutting trees down to create single-use paper bags just isn’t the most useful application of wood or wood fibers. There has been a very successful movement to sustainably manage forests, and this is definitely progress, but we need to be as responsible as possible when we use this resource. When a material is biodegradable, that means it is a natural compound and that if exposed to the proper conditions, this item will break apart at a molecular level into smaller and smaller pieces. For instance, paper is a natural material typically made from processed tree fibers. When paper products are placed in just the right conditions, the carbon and other building blocks will separate and reabsorb into soil, or whatever natural elements are nearby. The key here is that the proper conditions must be met for paper bags to biodegrade. If paper bags are tossed in a compost bin or end up as litter, they will not necessarily biodegrade. If paper bags are tossed in a municipal compost facility they will break down. Paper bags can be recycled, and they are much easier to recycle than plastic bags. When paper bags are recycled, the material can be repurposed into new paper products that can be used again. The only drawback to recycling is that paper can be recycled only a limited amount of times. Every time paper is recycled, the fibers become shorter and eventually, they will become too short to be processed. What Material Makes the Best Shopping Bags for Retail and Marketing? Responsible use of resources, forest management and how paper bags are handled after they have fulfilled their usefulness, all contribute to the problem with paper bags. By contrast, reusable bags can last for several years and will work to market your brand. Our reusable bags are made from recycled or sustainable materials, which means they are easy on the planet and they can be recycled when they are no longer useful. If you want to learn more about our how reusable bags and our design, order, or production process get in touch! We can manufacture reusable bags specifically for your project, trade show or brand so you have a unique bag that no one has seen yet, and everyone will want. Contact us to find out what we can do.